Regions bank sent out a letter (click here for a copy) to us here at the Nobles Law Firm warning of yet another scam targeting attorneys. According to the Regions letter, the scam involves a law firm receiving an email from a foreign entity requesting the firm to act as a collection agency or purchasing agent on its behalf. At some point, a counterfeit check will show up with a request that the firm deposit the check, keep a fee and return the remainder to the foreign entity by wire. As you may have guessed once the law firm figures out they have cashed a counterfeit check and have sent good money to a scammer, it is already too late. That is a rather old scam, but one that seems to be making the rounds again. 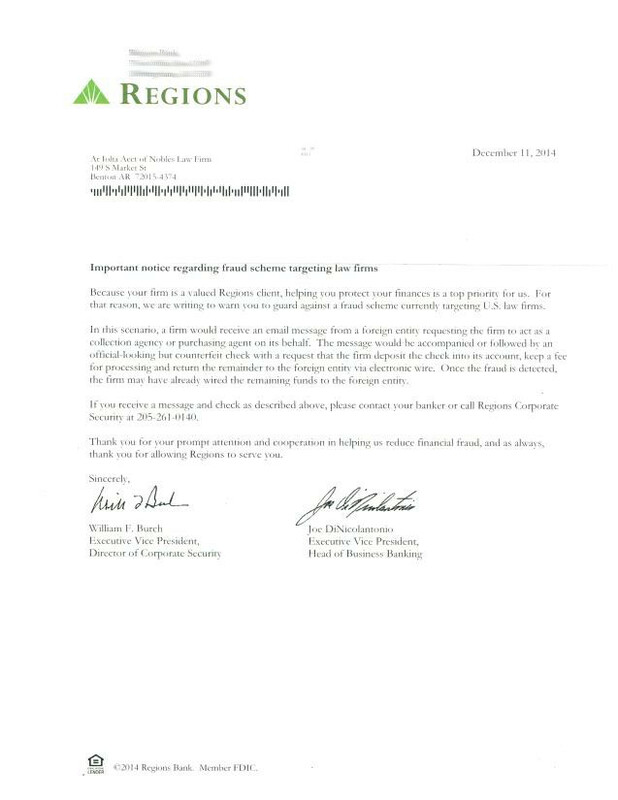 The regions letter states anyone receiving a message and check as described above to contact their local Regions bank or call the company’s Corporate Security office at (205)261-0140. ← Does the law recognize Internet reporters as ‘real’ journalists?